This picture was taken on Lucy's 24th birthday during the time Cliff was stationed at Fort Jackson, SC, while serving in the US Army. What would we do today if we had to return to doing various clerical jobs without the use of a computer? It would be hard, wouldn’t it? And if one of our county officials had to return to the way she began her job, she wouldn’t even have the use of an old fashioned typewriter. When she began, every single thing she did in her job was done by hand. That person is Lucy Newberry who has served as the Overton County Registrar for over 40 years. For a look back into the life of Lucy Newberry, here is some background information. Lucy grew up in the Wirmingham community. Her parents were Elbert Leroy Vaughn, everyone knew as Roy Vaughn, and Rillie (Smith) Vaughn. Lucy is the oldest of the six children who include Ellery, Emma Dee, Keven and Natalie. Another brother died shortly after birth. Roy Vaughn made a living for his family as a farmer. He also served as song leader for the Midway Christian Church. Lucy described him as a very strict father who believed quite firmly in bringing up very disciplined children. Lucy had a close relationship with her mother, and referred to her as "my buddy." Her mother was someone Lucy could share everything with, even letters she got from her boyfriends. She said her mother was a very gentle lady, and anyone who ever met Rillie Vaughn will certainly agree with that statement. Both of her parents taught their children to be honest and hard working, and that lying and stealing would not be tolerated. The Vaughn family lived in a small home in the Wirmingham community. There were three beds in the front room of the house, and later, when the children got older, they slept upstairs. The girls were on one side, the boys on the other, with a curtain serving to divide the room. The Vaughns lived a very humble life, and none of the children were ever in any serious trouble. 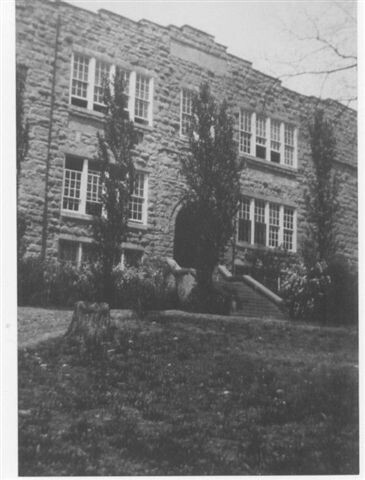 The older Vaughn children attended grade school at Wirmingham. The year Lucy should have gone on to her first year in high school was repeated in the eighth grade at Wirmingham because her parents could not afford the required tuition at Alpine High School. When she was 15, she enrolled in the Alpine freshman class. Students attended school year around then, and once enrolled, they could work for their tuition. The girls helped with the cooking, while the boys worked on the farm. Meals were prepared for the students, teachers, and any visiting guests of the faculty. It was while Lucy was attending high school at Alpine that she met the person who became her husband, Clifton Newberry. Many will remember him as either Cliff or C.D. Newberry. During the early days of their courtship, the young couple would sit together during church service at Alpine, and hold hands under a song book. Sunday afternoons were times when courting couples attending Alpine high school could be together, but only by sitting in the dining room with a teacher chaperoning from the next room. Alpine High School was the place Lucy and Cliff's courtship began. The building was demolished several years ago. From time to time, singing games would be held around the area. It was a one of these occasions held at Miller’s Chapel that Lucy and Cliff had their first real date together. Singing games consisted of a band playing country music and those who attended could dance. Someone would be present to serve as the caller for the square dancing. One of the dances everyone participated in was called twisting the grape vine. When Cliff and Lucy were 18, Cliff asked Lucy’s father if they could marry, and Mr. Vaughn gave his permission. The young couple were married on the front porch of the Vaughn house. A country preacher by the name of Tommy Ferrell performed the ceremony. This same minister had many years earlier read the wedding vows for both the bride and groom’s parents. Lucy and Cliff lived for the first five months of their married life in the house with his parents. The first home they had was a house that originally belonged to Cliff’s grandfather, and Lucy still lives in that home today. As a young married man, Cliff farmed, and when working for neighboring farmers, was paid seventy-five cents a day. Lucy took care of their home, made a garden, and tended to the chickens and cows. She sold eggs and chickens to supplement their income. A little over a year after they married, their daughter, Mary Lee, was born. During the years when Mary was small, Cliff took a radio and television repair class, worked as a clerk in Gentry Copeland’s store, and later, operated a feed store and hatchery at West Fork. During the early years of their marriage, Cliff began operating a grist mill in the West Fork area. The way he came into possession of the mill was by trading a calf he and Lucy had as a down payment, and the balance owed on the mill was paid off with proceeds he received from grinding corn for people living in that area. 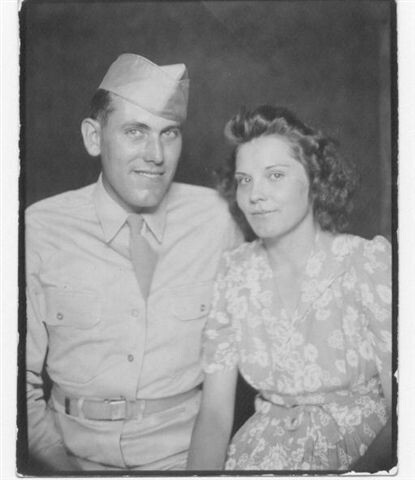 Cliff was drafted into the United States army after he and Lucy married, and while he was away in service, his father, Elmer Newberry, ran the mill for him. Life was not very easy for anyone during those years, especially for those who made their living in the mines in areas not too far from Alpine. It was during the time that the mines were closing down that a commodity program was put into place for miners and their families. When funds were made available for this commodity program in Overton County, Lucy was asked by the County Commissioners to serve as the person in charge of distributing commodities to the miners. She agreed to that the position and served in that capacity for around five years. Commodities were brought in by truck and stored in the basement of the building at West Fork that Cliff used for the feed store. Miners were required to sign up and complete qualification papers before being allowed to receive items that fed their families such as cheese, powered milk, beans, meal, and flour. Eventually, the location for the commodities program was moved to the upstairs of the building that was once known as Bilbrey’s Grocery on the square in Livingston. At that time, Lucy’s office was next door to Mrs. Phyllis Allen who held the office of Registrar. When Mrs. Allen’s health began to decline, there were many days when Lucy went across to the Registrar’s office to help Mrs. Allen with her work. Eventually, Mrs. Allen resigned because of poor health, and Lucy was asked by the Overton County Election Commission to take her job. When she began, all the paper work in her office was done by hand. During that time, Overton County had a total of 19 precincts. Every community had a voting precinct. Today there are five districts, and each district has three precincts. Ballots are prepared on a computer, but have to be approved by the state prior to being used in an election. For many years, Lucy had a tiny little office in the courthouse that provided little in the way of storage or even much room to work in. Today, her office is in the courthouse annex on University Street, and has a much better work environment. In 1971, the election commission agreed to hire someone to help Lucy with the heavy workload involved in her office. Her daughter, Mary Allred, was selected for that position. In addition to Mary, Lucy has four other employees during the time elections are held. Lucy and Cliff’s long married life ended in 1995 when Cliff passed away. A good bit of his adult life was devoted to serving Overton County as both a county commissioner and as a judicial commissioner. Performing marriage ceremonies was something else he did while in office. Music was a part of his life as well. He played guitar and sang with a group. Lucy would join in with their band on lots of occasions too. They traveled to many different churches in the areas on Sundays for special singing that were held. Lucy has seen many changes come about over her many dedicated years of service to Overton County. Following the completion of a required course for persons holding the position of Registrar in the state of Tennessee, Lucy now has a certificate that gives her a new title "Certified Administrator of Elections." She laughed as she told me how she felt when she got the first computer to use in her office. Her words were "I thought I was rich!" To look back at a time when she completed every single transaction in her office by hand, and compare it with today, when the computer is a very important part of the work in her office, it’s easy to understand why she thought that. She is to be commended for the many long years of service she has devoted to the citizens of Overton County and the Overton County Election Commission.